Road’s End Farm gives a deeper sense of involvement by getting everyone personally invested in the program. If there is one word to describe Road’s End Farm Horsemanship Camp, “Magical” is the one that is heard the most. Family-owned and operated since 1958, Road’s End Farm allows Girls to be themselves in an environment that supports responsibility and personal growth with the highest priority on making sure everyone has a great time. 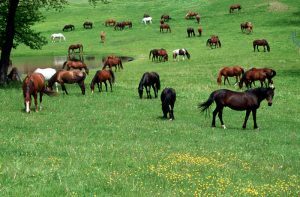 While there are many camps that specialize in equestrian activity, Road’s End Farm gives a deeper sense of involvement by getting everyone personally invested in the program. Everyone helps with chores on a daily basis, whether it is feeding the horses, clearing stones, cleaning the shower house, or the many other tasks that need to be done for the program to operate. The saying “Many hands make light work” is heard frequently around the farm. The notion that “This is your farm” inspires a sense of responsibility for its care, and the resulting sense of accomplishment is highly valued in the farm experience. Road’s End Farm is a small program by design, averaging around 60 campers through its 12-week summer, which includes sessions of two to nine weeks long. A former camper comments, “This is a small camp that really makes it personal for the campers and their families. 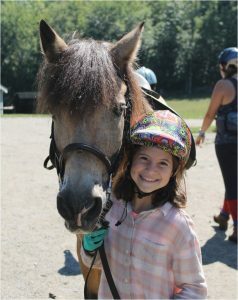 I highly recommend this camp to any young girl who loves horses, the outdoors, and just plain having fun!” There is a 75% return rate among campers, and former campers typically make up half of the staff. The staff at Road’s End Farm is selected with an emphasis on kindness and a focus on the kids. 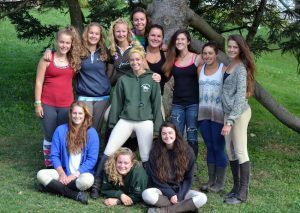 Between the outstanding English riding program, the emphasized work ethic and responsibility, focus on each girl’s personal growth, and the lasting friendships that develop, Road’s End Farm is truly a magical summer camp experience.